In view of the potential significance of the whole ‘light slowing down’ issue to creationists, it is worth reviewing it briefly here. Well over a decade ago, CMI’s Creation magazine published very supportive articles concerning a theory by South Australian creationist Barry Setterfield, that the speed of light (‘c’) had slowed down or ‘decayed’ progressively since creation. In one fell swoop, this theory, called ‘c decay’2 (CDK) had the potential to supply two profound answers vitally important for a Biblical worldview. God created the starlight on its way: this suffers grievously from the fact that starlight also carries information about distant cosmic events. The created-in-transit theory means that the information would be ‘phony’, recording events which never happened, hence deceptive. The distances are deceptive: but despite some anomalies in redshift/distance correlations (see Galaxy-Quasar ‘Connection’ Defies Explanation), it’s just not possible for all stars and galaxies to be within a 6000-light-year radius—we would all fry! But if light were billions of times faster at the beginning, and slowed down in transit, there would be no more problem. Since most nuclear processes are mathematically related to the speed of light, a faster ‘c’ might well mean a faster rate of radioactive decay, thus explaining much of the evidence used to justify the billions of years of geological hypothesizing. In fact, top-flight creationist researchers involved with the RATE (Radioactive Isotopes and the Age of the Earth) project have found powerful evidence of speeded-up decay in the past (see their book (right). CDK might offer a mechanism. He and Trevor Norman, a mathematician from Flinders University in South Australia, published a monograph4 outlining this, and answering several arguments raised against the theory. The monograph also showed how, over the past years, the measurements of the value of various constants (e.g. electron mass, Planck’s constant (h)) were varying progressively, if ever so slightly, in a ‘directional’ fashion consistent with the direction predicted by their mathematical linkage with ‘c’. With such a bombshell, there were, not surprisingly, substantial efforts at scientific assessment and criticism. The critiques were not only from those motivated to undermine Biblical cosmology, but from leading creationist physicists. Criticism (‘iron sharpening iron’ as Proverbs 27:17 puts it) is meant to be a healthy process enhancing the search for truth in science. The criticisms centered around two issues: the first was the validity of the statistical data itself, particularly the reliability of some of the earlier measurements of c given their large uncertainties, and the other was the consequences we should find in the present world if c has declined. This is an immensely complex area; for one thing, when c changes, so do other things, which can become mind-boggling to sort out, even for the experts. One of the attacks concerned Einstein’s special relativity, E = mc2 and the like. (If c is a billion times greater in the past, then E would be a billion billion times greater, so would not a campfire be like an atom bomb, and so on?) Critics at the time used this to mock CDK, but Setterfield answered that rest mass itself is inversely proportional to c2, so that energy is still conserved. He also claimed that there is experimental evidence that the charge to mass ratio of an electron has been decreasing (supporting his claim that mass has increased as c2 has decreased). But as usual, the skeptics, along with ‘progressive creationist’ (long-age) astronomer and ardent ‘big bang’ advocate, Dr Hugh Ross,5 kept repeating this claim as if Setterfield hadn’t thought of this and answered it. Whether one agrees with his answer or not, it was improper to ignore it (or perhaps his critics, lacking any qualifications in physics, didn’t understand it). But, intriguingly, it now turns out that the fine-structure constant is in fact slightly different in light from distant stars compared to nearby ones. In fact, this is the very reason that physicists of the stature of Davies are now prepared to challenge the assumption that light speed has always been constant. And in addition to being different from the prediction of the Setterfield theory, this research by itself does not support c-decay theory of the magnitude that Setterfield proposed. The change is billions of times too small. In fact, the newspaper hype surrounding Davies’ theory, and the quotes attributed to him, hardly seem to be justified by the Nature article itself, which is rather speculative. NB, although Setterfield predicted constant α, given the small change and tentative nature of this new discovery, by itself it is not conclusive evidence against the Setterfield theory either. See an earlier CMI response to reports of a change in a, Have fundamental constants changed, and what would it prove? Unfortunately, despite being urged to continue to answer critics and further develop his theory within the refereed technical creationist literature, Setterfield effectively withdrew from that forum some years ago, though not from individual promotion and development of the idea, e.g. on the Web. Well known creationist physicist, Dr Russell Humphreys (now with ICR), has long given credit to Setterfield’s challenging hypothesis for stimulating the development of his own cosmology, which seeks to answer the same question about starlight, and which is currently in favour among many creationist astronomers (see How can we see distant stars in a young Universe?). Humphreys says that he tried for over a year to find a way to get CDK to ‘work’ mathematically, but gave up when it seemed to him that so many things were changing in concert that it would be hard to detect a change in c from observations. It’s also important to note, as we have often warned, that newspaper reports are often very different from the original paper. The actual Nature article, as shown by its accurate title, was about how the theory of black-hole thermodynamics might determine which is correct out of two possible explanations for previous work that claimed that FSC might have increased slightly and slowly over billions of years. The details are summarized in the box below. In conclusion, the authors (who are also prepared to accept that their interpretation of the data may be wrong) still believe in billions of years, and would reject the relatively rapid change in c that Setterfield proposed since they are talking about <0.001% over 6–10 billion years. To be fair to the journalists, Davies has long been something of a publicity seeker. So he possibly didn’t mind at all that his actually quite non-descript paper was being publicized (it was actually less than a full page in total length in the ‘Brief Communications’ section, and didn’t rate a mention as a feature item), even for something peripheral to the paper. Still, it is fascinating to see vindication for at least the possibility that c has changed. Whether this decline (if real) has only just ceased recently, as Setterfield proposed, or happened earlier (perhaps in a ‘one-step’ fashion), or is still going on, is another question. Whether Setterfield is truly vindicated remains to be seen; the process would be greatly helped by further scientific debate of the actual issues in Journal of Creation or the CRSQ. In the absence of such involvement by skilled proponents of the theory, CMI cannot take a strong stand. In fact, in our publications over the last few years, we have tended to strongly favour Humphreys’ relativistic white hole cosmology, though always pointing out, along with Humphreys himself, that it was just one alternative model, and not ‘absolute truth’. It is clear, though, that the issue is so complex, that one or two pronouncements of ‘certainty’ by a physicist or two, whether creationist or evolutionist, should not be taken as the death knell of the notion or any aspects of it—nor as final proof of it. It is truly ironic to look back at the time when some creationists were actively putting forward CDK as a profoundly important hypothesis. The anticreationists, both the anti-theists and their compromising churchian allies, launched their attacks with glee. Skeptics around the world seldom failed to have audiences in fits of laughter at the ‘ridiculous’ notion that what they labeled as a ‘certain cornerstone of modern physics’, the alleged constancy through time of the value of c, was wrong. No matter what comes of his notion as a whole, no matter even whether c has actually changed or not, in that sense at least, thanks to Paul Davies, Setterfield (and those, like ourselves, who supported his pioneering efforts) has already had the last laugh. I believe we need to understand, as most physicists really do, how immensely little is yet known about such major issues. What if Humphreys is right, for instance, and the answer lies in the general relativistic distortion (by gravity) of time itself in an expanded (by God who ‘stretched out the heavens’ as Scripture says repeatedly) bounded universe? Would not the world have laughed if such notions (as time running differently under different gravity influences, for instance) had first been put forward by modern Bible-believers? They would have been seen as ad hoc inventions, but they have been experimentally tested. This ‘secular CDK’ announcement, by one of the biggest names in physics, should really be an antidote to the confident arrogance of long-age big-bangers. So should the recent landmark Journal of Creation paper by Humphreys showing observationally that we are in fact close to the centre of a bounded universe (download PDF file Our galaxy is the centre of the universe, ‘quantized’ red shifts Show). All in all, it’s an exciting time to be a Genesis creationist. But then, it’s always been an exciting time to take God at His Word. What was Davies’ paper really about? Already known: the fine structure constant α = 2πe2/hc, where e is the electronic charge and h is Planck’s Constant. Last year, there was a claim that α is increasing over time [as CMI reported in Have fundamental constants changed, and what would it prove?]. So this increase in α could be due to increasing e or decreasing c (CDK). But as mentioned, this conflicts with Setterfield’s model that has α invariant with varying C because it’s h that varies inversely to c.
The Second Law of Thermodynamics is in force. The entropy of a black hole increases with area of its event horizon (that’s if the standard formula applies with either varying c or e). Therefore the area cannot decrease unless the black hole’s environment has a corresponding entropy increase. Our arguments, although only suggestive, indicate that theories in which e increases with time are at risk of violating both the second law and the cosmic censorship hypothesis. But a decrease in c over time would lead to an increase in a black hole’s area, which is in line with the Second Law. So by a process of elimination based on this theory about black hole thermodynamics (not on any new data), a tiny decrease of c is the right explanation for the tiny increase that was previously claimed for α over time. Davies, P.C.W., Davis, T.M. and Lineweaver, C.H., Black holes constrain varying constants, Nature 418(6898):602–603, 8 August 2002. Return to text. The word ‘decay’ is used here to describe declining velocity, without necessarily implying any thermodynamic or moral ‘decay’ in that sense of the word. Return to text. The decay curve chosen to fit the data was c = √[a + ekt(b + dt)], a square root of the critically damped harmonic oscillator equation. A critically damped system is one that reaches equilibrium as fast as possible without any overshoot or oscillation. Return to text. Norman, T.G. and Setterfield, B., The Atomic Constants, Light and Time, 1990. Return to text. Ross, H.N., Creation and Time, Navpress, Colorado Springs, pp. 98–99, 1994. Return to text. Interestingly, Davies thinks that a changing c would have grave consequences for Einstein’s theory, which may be superseded by another theory which encompasses all the observations including changing c. Return to text. Setterfield proposed that since energy must be conserved in atomic orbits, then h must be inversely proportional to c. Therefore any constant that contains the product hc with other constants, includingα, must also be constant. Norman and Setterfield, Ref. 4, pp. 33–39. Return to text. Creation 21(4):38–41, September–November 1999. Return to text. Barrow, J., Is nothing sacred? 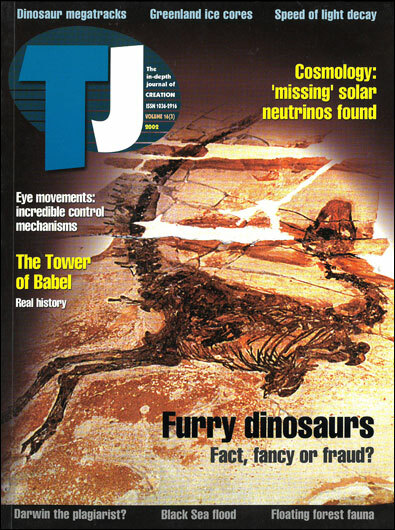 New Scientist 163(2196):28–32, 24 July 1999. Cf. ‘C’ the difference, Creation 22(1):9, 1999. Return to text. Adams, S., The Speed of Light, New Scientist 173(2326) Inside Science, p. 4, 19 January 2002. Return to text. Newton, R., Distant starlight and Genesis: conventions of time measurement, Journal of Creation 15(1):80–85, 2001. Return to text. Ref. 8, p. 41. Return to text.